It’s probably no surprise that many in the Middle East see religious and ethnic hatred as the greatest threat, while Europeans tended to choose inequality. Africans are more concerned with AIDS and other infectious diseases, while scattered countries, many with good reason, chose the spread of nuclear weapons or pollution and environmental problems as the top danger. The global study is presented on PewGlobal.org’s Gobal Attitudes Project page. The dots on the first map represent the countries that express the highest level of concern about each danger category. The geographical clustering shows that countries’ choices often reflect regional concerns as well as internal problems. 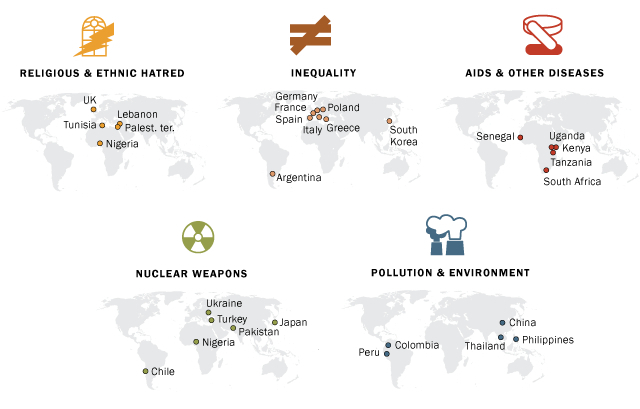 The Pew Research Center’s Global Attitudes Project conducts public opinion surveys around the world on a broad array of subjects ranging from people’s assessments of their own lives to their views about the current state of the world and important issues of the day. Over 330,000 interviews in 60 countries have been conducted as part of the project’s work.